EY is a global leader in assurance, tax & law, transaction and advisory services with more than 230,000 people based in 150 countries. Our law practice is undergoing global expansion so that we can serve our clients anywhere in the world, now in around 70 countries. 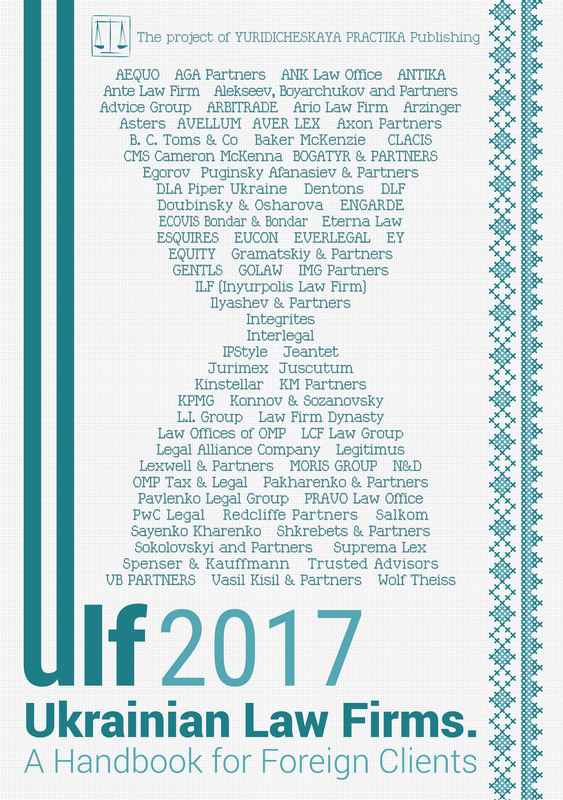 EY has a strong full-fledged legal practice in Ukraine, well versed in both local and international legal matters and practicalities and that has an impeccable track record. A team of more than 40 qualified lawyers provides a wide range of services to numerous international and local clients. Our more than 20-year history of operations in Ukraine and the CIS ensures our deep understanding of the local environment and knowledge of Ukrainian business peculiarities. We have strong experience in all major fields of law, particularly in the areas of commercial, corporate and contract law, legal structuring, regulatory compliance, finance, currency control and banking regulations, etc. Key areas of our expertise are tax (consulting and litigation), transfer pricing, corporate, M&A, labor & employment, private clients / wealth management, public-private partnership, antitrust/competition and intellectual property. Our industry focus is also diverse covering, among others, energy & natural resources, banking and finance, agribusiness, real estate and construction, retail, FMCG, healthcare, pharmaceuticals and information technologies. We are known for breaking new ground in various high profile and technically complex projects. These range from our unique expertise of working on oil & gas productions sharing and joint activity agreements, restructuring of the largest business groups and state-owned enterprises and supporting several largest transactions in our country to such matters as sale of football players or healthcare system reform in Ukraine. Law leader for Ukraine is Albert Sych, Partner. In these current uncertain times in Ukraine, a key target of High Net Worth Individuals (HNWI) remains to protect their assets and keep their business competitive and flourishing. Automatic exchange of information on residents’ assets and income according to the Common Reporting Standard, unwillingness to lose earned capital, entrenched bureaucracy and absence of a favorable investment climate in Ukraine are driving more and more Ukrainian HNWIs to emigrate to other jurisdictions, or at least to acquire a residency permit in one of the EU countries. The choice of country for business immigration depends mainly on personal goals and the desired lifestyle of the individual, availability of favorable personal taxation regimes, simplicity and swiftness of obtaining residence permits, possibility of obtaining citizenship in the future and, naturally, the cost of immigration. If an individual intends to receive permanent residence in a country of immigration, some additional factors such as ecology, crime level, stable political and economic environment, high-quality health care, education and social security should also be considered. Many countries currently have immigration programs designed specifically for business immigration of HNWIs, allowing them to obtain a residence permit or citizenship by investing in a country’s economy. For several years now, Cyprus, Malta and the United Kingdom have been the most popular countries for various forms of immigration of Ukrainian HNWIs, offering a favorable taxation environment, a high degree of capital protection and information confidentiality. Malta, for instance, offers citizenship to those who are ready to make a non-returnable contribution of EUR 650,000 to the Maltese economy, purchase real estate property in Malta or invest in Maltese bonds for another EUR 500,000. As a result, in addition to Maltese citizenship an investor also receives access to a special taxation regime, the so-called “remittance basis”, where an individual’s foreign income is taxed in Malta only when an individual brings (remits) it to Malta. The United Kingdom has an investor program, which allows HNWIs to get access to permanent residency and, potentially, UK citizenship. Similarly to the Maltese program, HNWIs, who invest in the UK get access to a special “remittance basis” taxation regime. In comparison to Malta, the UK investor program is much more expensive as the HNWI should be willing to invest at least GBP 2,000,000 in the UK economy. However, as opposed to the Maltese program, there is no need to make a non-returnable donation. 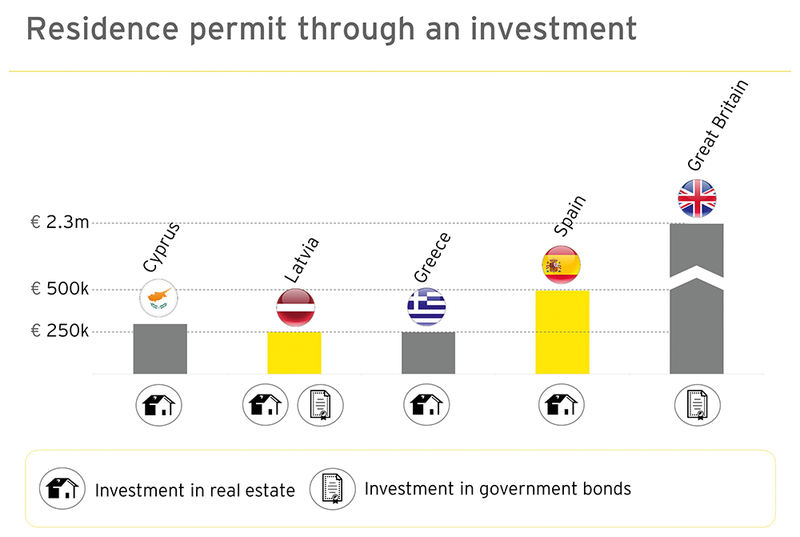 Notwithstanding the recent crisis, which led to bank deposit cuts, Cyprus remains one of the most welcoming destinations for business immigrants, allowing the acquiring of permanent residence in Cyprus for investing a minimum of EUR 300,000 into Cyprus real estate or even Cyprus citizenship for investing a minimum of EUR 2,000,000. 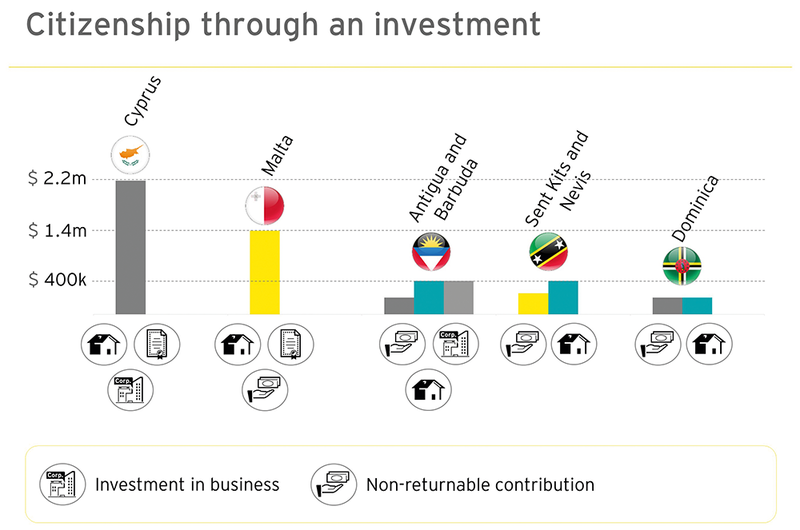 Moreover, the Cyprus program takes the least time to complete compared to other similar ones. Other countries, which business immigrants should definitely look into, are so-called “tax heavens”, with 0% personal income tax, wealth tax, inheritance tax and a gift tax. Some of the most popular tax heavens among the Ukrainian HNWIs are Monaco and the United Arab Emirates. In any case, while choosing a destination for business immigration, one should carefully evaluate all the pros and cons of emigrating to a particular country, taking into account all the circumstances. In addition, irrespective of a chosen destination, in order to make an efficient tax planning, HNWIs should also devote particular attention to their tax matters in Ukraine and wrap-up their Ukrainian tax residence. Being a Ukrainian tax resident means that an individual pays taxes in Ukraine out of his or her worldwide income, as opposed to tax non-residents, who are taxable only on their income sourced in Ukraine. Quite often, the ceasing of Ukrainian tax residence status is part of the tax planning of a Ukrainian business immigrant. To determine an individual’s Ukrainian tax residence status, one should analyze several criteria set out in Ukrainian law — place of residence, place of permanent residence, a center of vital interests and the number of days spent in Ukraine in a particular calendar year. However, is it sufficient for a Ukrainian citizen to reside outside of Ukraine for the major part of the year to become a Ukrainian tax non-resident? According to the Ukrainian tax authorities, it is not. The tax authorities insist that citizens of Ukraine are deemed to have a place of permanent residence in Ukraine and, thus, should be considered as Ukrainian tax residents until they pass the official procedure of leaving for permanent residence abroad. dual’s Ukrainian registration and inform various Ukrainian state authorities about an individual’s permanent residence abroad (e.g. the Ukrainian tax authorities, military enlistment office, State Migration Service, etc.). In October 2016, the procedure was slightly changed and made clearer. In the past, at the end of the procedure an individual had to surrender his or her internal Ukrainian passport, while now an individual keeps his or her internal passport with the stamp of the State Migration Service confirming that he or she has left Ukraine for permanent residence abroad. It is not a mandatory requirement to complete the said procedure. However, it gives sufficient grounds to treat such an individual as a Ukrainian tax non-resident, taxable only on his/her Ukrainian-source income, provided that this individual actually resides abroad. Another very important goal that one could reach by completing the procedure is acquiring the status of a Ukrainian currency control non-resident. This would allow the individual to transfer funds abroad from a personal bank account in Ukraine without limits, as well as purchase real estate or stocks abroad without the necessity to obtain an individual license from the National Bank of Ukraine allowing such an operation. It is worth noting that completing the procedure of leaving for permanent residence abroad does not mean the loss of Ukrainian citizenship or limitation of the individual’s civil rights, but rather ensures settlement of all obligations related to Ukrainian citizenship of the individual when staying abroad. Thus, it is recommended to include completion of the procedure in the plan on business emigration abroad.